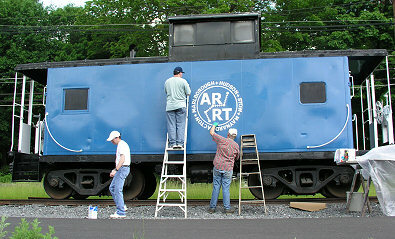 May 27, 2006: 4 ARRT volunteers started painting the ARRT logo on the Hudson caboose. The rain held off long enough to get one side finished. We estimate it will take at least 2 more sessions to finish the other side, so watch the calender page for more dates. More pictures are in the volunteers gallery. April 24, 2006: The Marlborough Community Development Corporation (MCDC) in coordination with the Assabet River Rail Trail, Inc. is working on improving the Rail Trail in the city of Marlborough. This will help the city in making the Rail Trail a better asset to the community. Interested ARRT members and the public are invited to attend any of the two May design sessions listed on our calender page. Those who can't attend can complete the online survey. February 14, 2006: The Town of Acton will be putting the 25% trail design out to bid this Spring. The plan is to have the contract awarded by June and design finished by the end of 2006, in order to maintain our construction funding in the 2008 state budget. The $170,000 cost of the design was authorized by the 2004 Acton Town Meeting. January 23, 2006: The U.S. Fish and Wildlife Service released their proposal to build a new regional Visitor & Environmental Education Center that would be located at the Assabet River National Wildlife Refuge. Their proposal would also allow bicycling on 5.25 miles of refuge roads and trails, as a means of access to the visitor center and as a connection to the existing Assabet River Rail Trail. Our condensed and highlighted version of the bicycle related parts of the document are here and include a map. May 2, 2006: In yesterday's Maynard Town Election, voters approved joining the state Community Preservation Act (CPA) program by a 2 to 1 margin. This is big news for the ARRT, as it's hoped that a CPA grant will be how Maynard funds the town's share of the trail. On the same day, the annual Hudson Town Meeting approved $15,000 as the local match for the new trail pedestrian cross-light at Whispering Pines on Route-62. This light had been unfunded in the 2004-2005 Hudson construction. 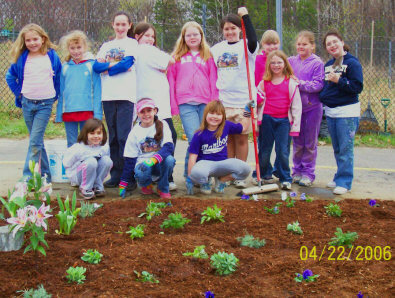 April 22, 2006: Marlborough Earth Day saw the Girl Scouts of troops 7034, 7034, 2815 and their friends planting a new garden at the trail crossing at Fitchburg Street. ARRT also sponsored a trail cleanup the same day. More of the Saturday pictures are here.